DUOCRACY. The system used in the Mughal Empire and elsewhere, this is a government in which the people are represented, though not via elected representatives, but in which the power of the people is balanced by that of the monarch. In the Mughal Empire the representatives of the people are selected at random, via a process of Sortation, but in other nations with similar systems the aristocracy or other such groups may fulfil this role. States of this kind, with a powerful monarch and a powerful parliament (or other governmental system) are known as Duocracies ('two rule'). Many of these depend on a constitution or charter of some kind, such as the Mughal Kabir Manshur (Great Charter), to prevent one side or the other from becoming too powerful and unbalancing the system. Because of the success and stability of the Mughal Empire it has become an exemplar for other regimes around the world [much like the USA of the real world]. FEDERALISM. The system used in the Dakshina Nad and the Sarajevo Pact, in which a group of different nations, often with radically different political systems, have come together for some mutual purpose, often defence against a common foe, and which has, over time, led to increasingly strong political and economic ties between the constituent nations, to the point of their being a single nation from the point of view of external governments. Like the Mughal Empire, because of the success and stability of the Dakshina Nad its system of government has become an exemplar for other regimes around the world. REPUBLICANISM. The system known as democracy in the real world, these are states where the populace elects the people who represent it in government, normally by means of secret ballots. The elected representatives are the only ruling power in the country. In Gurkani Âlam governments of this type are not the most widespread form, but they are fairly common. Most of the Republics of the world are based on one of two models, either the Polish or the French. In the former case, which has worked, with some modification, since the eighteenth century, the parliament elects both a figurehead monarch, and also the head of state. In the latter, based on the Estates-Universel system put in place in the Second French Revolution, the monarch, although nominally head of state, is a powerless figurehead, with the actual head of state being selected from the elected representatives. CORPORATOCRACY. The system in place in the Anglo-Danish Empire, in which there are two powerful forces in government, one the elected parliament and the other the three major trading companies that dominate most of the mercantile activity in the Anglo-Danish Empire and which are known as the Great Three. The monarch also retains significant political power in the Anglo-Danish Empire. SOCIALISM. Although socialism has not become a unified political force in this world, socialist ideas are still widespread, and are used by many governments. In particular, the Mughal government is heavily influenced by Sikh ideas, with Sikh Gurdwaras forming the basis for many means of assistance for the poor, including food, education, housing and medical care. In the Dakshina Nad the ideas of Buddhist and Muslim socialism are widespread [though these movements are different to the real world movements of the same names]. In Europe there are a number of socialist movements, many influenced by Christian ideas, and others, particularly in the Anglo-Danish Empire and the New Commonwealth by the ideas of the Levellers and their intellectual descendants. SOPHOCRACY. A form of meritocracy which was first formalised by the Ottoman political philosopher Enver Sevket in 1874, it is the system of government used in the Ottoman Empire and also in a number of other states around the world. Precisely how 'merit' is determined varies a great deal between Sophocracies, leading to great differences between them. Many Sophocracies are also monarchies, but the position and power of the monarch varies from state to state, with them being powerless figureheads in some places, and possessing significant political power in others. Sophocracy as practised in the Ottoman Empire is very much an interpretation of the original writings of Enver Sevket. Likewise, other Sophocratic governments around the world are also based on interpretation of his words, but all the interpretations differ, some to the point of different Sophocratic governments being implacable enemies of one another for purely ideological reasons. THEOCRACY. There are a number of nations ruled by religious rather than secular authorities, the most powerful of which is the Holy Russian Empire and its satellite states. In these nations political and religious power are the same thing, and national leadership rests with the leadership of the church. In the Holy Russian Empire the head of state is the figurehead Tsar or the Romanov dynasty, but actual power rests with the Patriarch of Moscow, Constantinople, All Russia and All Bulgaria. PLUTOCRACY. Rule by the wealthy, as practised in Pudhiya Kozhikode in the Dakshina Nad. DICTATORSHIP. Any of a number of non-monarchical absolute governments which exist in the nations of the world. THE ONE TRUTH BLOC. A political grouping based on the assumption that one religion only is the One True Faith, with all others being wrong. Most nations in this bloc have moved from this simple viewpoint to also considering it their duty to 'save' those whose beliefs are 'wrong' by converting them to their way of thinking, by force if necessary. Over time most One Truth nations have realised that to have any success they require help from others, so various One Truth nations have allied with one another in an attempt to impose their ways on others. The Holy Russian Empire is the most obvious example of this a state in this bloc. There is much speculation that even if the One Truth bloc ever achieved its goals it would immediately fall to fighting amongst its constituent nations over which religion was the true One Truth. THE DHARMIC BLOC. A grouping based on religious tolerance, and in particular, as its name implies, on the Indian idea of Dharma. In general all religions are considered to be equally valid roads to the truth, and so none of them is the 'one truth'. Because of this the Dharmic nations tend to be more tolerant and accepting of all people, and do not, in general, go to war for religious reasons, though they do, of course, go to war for other reasons. Even when the state or the royal family is of one specific religion (for example, the Muslim Mughal Emperors), in Dharmic states they normally work to maintain inclusivity with all members of the population regardless of creed. The terms Dharmic and One Truth blocs were coined in 1870 by French political philosopher Fabrice Sertillanges as part of an analysis of the world political system. Over the years the Oikoumene Council has successfully mediated disputes in Europe, Africa, China, the Middle East and elsewhere, preventing or ending a number of wars. On the other hand it has also failed to prevent other wars, and in particular the Long War, although it made its best efforts to end this war as it proceeded, and also appealed for both sides in the war to not destroy the world with nuclear weapons, a plea that was largely listened to and abided by. Because of all of this the Oikoumene Council is fairly well-respected in the world [certainly more so than the United Nations of the real world]. Although not all of these rules have been adhered to, and in particular during the Long War, they have saved many lives over the years. Despite its best efforts the Oikoumene Council has been unable to achieve a universal ban on nuclear weapons or the use of space-based weapons such as the Qamari Mosht. There have been attempts to give the Oikoumene Council more teeth to enforce its rules on the nations of the world, but so far all such proposals have been rejected by the majority of nations. One of the failures of the Oikoumene Council is in their attempts to persuade the world to adopt a new, rational system of measurements to replace all of the different incompatible local systems used around the world [not unlike the Metric system of the real world]. This Oikoumene System was intended to help the nations of the world to cooperate and unify. However, it has never become widely adopted, and nations continue to use their traditional measurement systems. Originally based is Isfahan in Persia, with the coming of the Long War the organisation was forced to find a new home, eventually moving its headquarters to Oranjeburg, the capital of Oranjestaat, where it has come to very much overshadow the Freethought Alliance, which is also based there. The name of the organisation is derived from ecumene, a word meaning 'the inhabited part of the Earth', or the inhabited World, but which is also interpreted to mean simply the world as a whole. 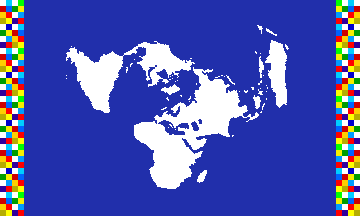 The flag of the Oikoumene Council is a dark blue field with a white map of the world as viewed from the north pole centred on it [not unlike the view of the world presented on the flag of the United Nations in the real world]. Down each edge of it is a band of small squares filled with many different colours, representing the colours of the flags of the nations of the Earth. An organisation that includes a number of nations with Vrijdenkerij (that is, atheist) governments which banded together in 1814 for mutual protection and trade. Since then it has evolved into a third lesser power bloc, occupying a middle ground between the Dharmic and One Truth blocs. Some Vrijdenkerij nations are tolerant of all faiths, but want none of them. Others actively work against all religions. The Freethought Alliance has its headquarters in Oranjeburg, the capital of Oranjestaat, where since the Long War it has come to be very much overshadowed by the Oikoumene Council, which came to be based there in 1953. Even before that the Freethought Alliance was becoming weaker and weaker as the Oikoumene Council grew in influence. Because of this it is now a discussion forum for a small number of nations only, which continues to be used out of tradition more than anything else. Over the years reasonably close links have developed between France Équinoxiale and its Spanish-descended neighbours. As such they joined formally in 1844 into what in known as Le Pacte d'Amazone (The Amazon Pact), a loose mutual trade and defence pact. The members of the Amazon Pact currently include France, Casaquiarja and Peru, with Prussian Suriname and the nations of the Tucumán Pact as associate members. Political differences with Casaquiarja have prevented New Granada from joining the Pact. A defensive alliance of the South American nations of Chaco, Chile and La Plata, founded in 1918, and named after the capital city of Chaco, where the Pact was signed. The three nations of the Pact are linked by their shared Spanish heritage, use of Sophocratic ideas in government (though none of them are actually Sophocracies), as well as their small size and lack of power relative to the great powers of the Anglo-Danish, French and Portuguese (now Brasealean) Empires. This latter is what drove them to link their fates via the Tucumán Pact, in the hope that it would make them a greater power in the world. Having made unsuccessful attempts to claim more territory in the southern tip of South America, by diplomacy and the Patagonian War, this has not become the case. During the Long War the nations of the Tucumán Pact had little choice but to bow to the demands of the Anglo-Danish and Brasealean Empires and fight against Scotland and France, helping to invade Mapuche and New Fife. However, as the Long War progressed, they were able to change sides returning Mapuche and New Fife to France and Scotland, joining Le Pacte d'Amazone as an associate member, and gaining territory in Braseal and Kingsland. Since the end of the Long War the Tucumán Pact has maintained friendly relations with France and Scotland, and other nations of Le Pacte d'Amazone, with whom they now have strong economic and military ties. A concept conceived by Alauddin Bakar Al-Haj, a colleague of Sultan Abdul Jalil of Johor, in 1833, who originally applied it to the Alam Melayu (Malay World. It proposes a political movement which would unify all Malay people everywhere, and all of the Malay Archipelago, into a single political entity superseding the current assorted Malay kingdoms. Although not accepted by the Sultan of Johor, the Alam Melayu movement lead to similar ideas taking root in other parts of the world. A 'Celtic World' movement grew up in Scotland, Ireland and Wales, as well as others in Scandinavia, Germany under the name of the All-German Party, Italy and the Middle East. Most of these movements came to nothing, but the Celtic World movement did cause enough unrest that, despite attempts to suppress it, the Anglo-Danish government had no choice but to grant more Welsh and Irish rights, give them limited devolution, and give their nations places on the Anglo-Danish flag. As part of this both Wales and Ireland became Dominions within Anglo-Denmark, and Ireland was granted a dispensation giving its Catholics equal rights with the other official religions in Ireland itself (as were Catholics in Maryland and Cuba within the Dominion of New England, and the entire Dominion of Mosquitia). Despite denials by the Indian governments, it continues to be rumoured that the Mughal Empire and/or the Dakshina Nad have a secret organisation of assassins working for them who are descended from the Thuggees and who do the dirty work of the government. There are a number of terrorist groups operating in the world, in particular Uzbek separatists, and many others funded by both sides in the Long War and who have now gone their own way. One major influence in the modern politics of many nations are the secret police and intelligence services of those nations. Having built up their power and influence during the Long War, with its end many of their governments wish to reduce their power again, something that those in charge of many of these organisations wish to avoid. Because of this many national governments are engaged in covert struggles between their nominal authorities and their secret services.